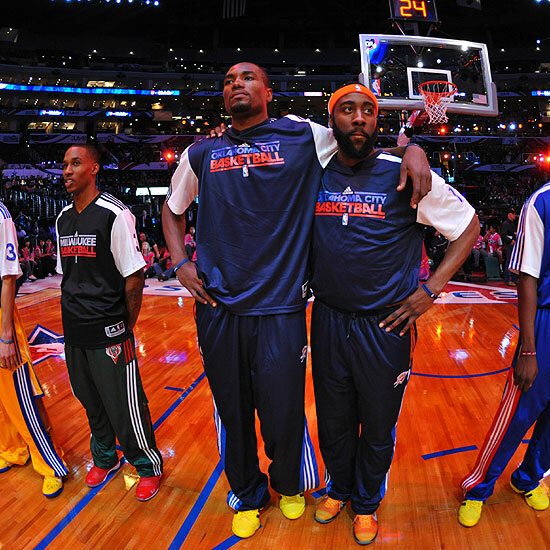 The competition for the Thunder’s third banana is in full swing between James Harden and Serge Ibaka. Harden provides on the offensive end what Ibaka provides on the defensive end. What I have begun to notice, though, is that teams, especially playoff teams, are starting to aggressively scout James Harden and his tendencies. Serge Ibaka is still a wild card, in that his untapped potential lends an air mystery surrounding how to guard him. The way Ibaka played at the beginning of the season is completely different from the way he is playing now. 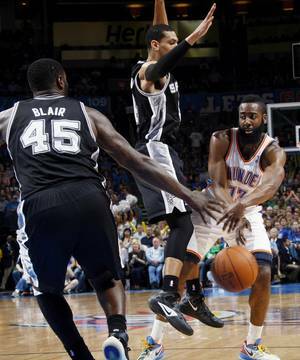 Eventually, Serge’s evolution as a player will plateau and teams will have a checklist on how to guard Ibaka. But for right now, the man receiving the opposing team’s attention on the defensive end is the Bearded One. When teams play the Oklahoma City Thunder, they have an idea of how to counter Kevin Durant and Russell Westbrook. They either have a physical defender for Durant or they hope that he has an off-night in the FG department. Regarding Westbrook, they either play him with a bigger player (a la Lebron James or Kobe Bryant), force him into the heart of the defense, or hope he has one of those high turnover, low FG percentage nights. Either way, it’s a classic case of pick your poison. But with so much of the offense coming from those two players alone, many teams are content with letting them get their numbers, and instead focusing their defensive attention on the rest of the players, especially James Harden. Nick completely screens the defenders and Harden backs up for an uncontested 3-pointer. Nick screens the defender just enough for Harden to split the double team and use his patented Euro-step to get into the lane. The defenders switch creating a mismatch that either Harden or Collison can exploit. With about a season and half worth of film on Harden and Collison, good teams are starting to do a couple things to stymie this effective offensive attack. First off, they are putting their hands up in the passing lanes. While Harden is an effective passer, he has a tendency to be predictable and, in essence, choreograph his no-look passes. The second thing that defenses are doing is closing up the lane between the two defenders in the pick and roll. This negates the ability for Harden to split the double team and get into the lane. This was very evident in the Heat game, when the 8 – 0 Heat run in the 4th quarter was spearheaded by two consecutive turnovers by Harden in this pick and roll scenario. 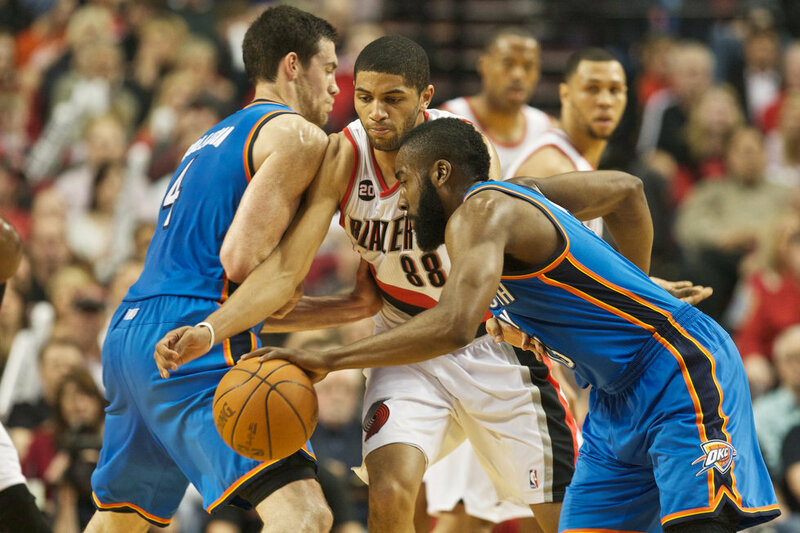 Great defensive teams will choose Collison to beat them offensively, instead of Harden. Harden has been the key to OKC’s offensive efficiency. Durant and Westbrook are going to get theirs. When you have the 2nd and 5th leading scorers in the league, they will find ways to put the ball through the basket. When Harden is allowed to be effective, he adds an entirely different dimension to the Thunder offense that makes the defense feel like the attack is coming in continuous waves. When he protects the ball and manages the second team, the team usually wins. In their 12 losses, Harden is averaging 3.5 turnovers per game. In the wins in which he has played, he’s averaging just under 2 turnovers per game (1.9). The predictability of Harden’s offense has allowed teams to start making defensive game plans against Harden. While the increase in turnovers over the past 10 games (3.4, as compared to 2.0 in the first 39 games) can be attributed to an increase in usage and minutes, there’s no denying that an efficient Harden is the key to the Thunder advancement this season and beyond. Just came across your blog and really enjoyed reading your NBA stuff. We currently have quite a few NBA writing openings on the FanSided network, and I think you’d be a great addition to our team. If you’d be interesting in contributing for one of our team sites or general NBA sites, let me know and we can discuss further details. If you are interested send me an email at akennedy@knights.ucf.edu.